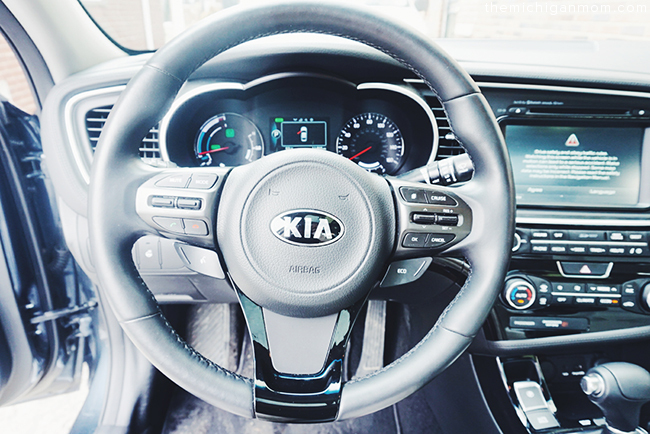 Of all of the cars I’ve reviewed in the past, the Kia Optima Hybrid is BY FAR my all-time favorite. If I was in the market for a car, I would purchase this one hands down, no questions asked! After driving this car around for a week I made up my mind that this was my favorite car and it was absolutely perfect for me. For starters, it looks sharp! There’s just something about it that makes it look so sporty yet chic and elegant. It arrived in this beautiful blue color that I loved and was so glossy I could see my reflection on the exterior every day. For a small car, it has a nice amount of storage in the trunk area and since I usually shop light anyway, this was perfect for me. I was able to put away more than a week's worth of groceries, all of my shopping bags from the mall and still had room to store away my son's car seat. It's more than enough room for me in terms of what I need to store each day. The seats were ventilated which allowed the air to be circulated throughout the day which means that if it’s a hot day outside, the seats would be comfortable to sit in and on a cold day the heated seats give off extra warmth to keep your passengers happy. The seats were very luxurious and I loved the addition of the ventilation because in other cars it can get really unbearable real quick. These were perfect! When I learned that they were also heated seats I thought about what an amazing car this would be during the cold winter days and humid summer days here in Michigan. Also? The back seats are heated too! So cool. It features a cup holder that easily pulls out and stores away into the seat of the car. I always love when cars have the pull-down cup holder option because you can easily seat up to three people when it's not in use, and when it is it makes seating two even roomier. The leg room in the back is pretty nice too, I have really tall brothers and they never complained about it being a tight space for them so that's another plus. From the steering wheel I had the options to control my radio settings and I could even answer phone calls while driving without ever having to keep my eyes off the road or dabble with my physical phone. There’s even a voice command option you can set up for easier use as well, it’s very user-friendly. Another great thing about the Kia Optima Hybrid, that is really important to me, is fuel-efficiency! It has a 2.0-liter gasoline direct injection (GDI) turbo engine that delivers 274 horsepower yet is also as fuel-efficient as a four-cylinder engine. Like a sports car, it allows you to shift gears effortlessly while keeping your hands on the wheel at all times because it does that work for you. It’s awesome! I had to accelerate in different areas quickly and even entering the highway was a breeze, it had a great transition and you could hardly feel the gear shifting. It was so smooth. You can listen to your favorite music through CDs, the radio, your phone and there’s even an available UVO eService infotainment system you can use as well you can use for music compatibility, scheduling appointments and more through voice command or touch screen. It’s very versatile so you can find the options that work best for you. I love the music I have on my phone so when driving I would normally just connect my phone via bluetooth and would be able to answer phone calls and listen to music while I drive. It also has A/C and heat which is a necessity! I really loved the dual climate control feature on the hybrid. It basically allows you and your passenger to control your own temperature settings. So if you would rather be warm in the summer like me because you're always freezing no matter what, you have the option of the heat and maybe your passenger would perfect a cooler temperature, or a temperature at a different fan speed– well, they can control that too! It's really cool and is a great way to keep everyone in the car happy. The panoramic sunroof was definitely one of my favorite features that allowed me to enjoy fresh air and sunshine! The buttons to open and close the sunroof and shade were really smooth and quick and I love how big the sunroof was in general! All of the passengers could enjoy it and this was my son’s favorite treat when riding with me, especially during the night. There’s an advanced airbag system and a standard antilock braking system in the hybrid, you can see what’s behind you with the rear-camera display while reversing that also comes with a back-up warning system, there are integrated LED turn-signals, and power-folding outside mirrors to help when you’re in a tight spot. I also really loved the blind-spot detection system that offers warning lights in the side mirrors to alert you when there’s a vehicle in your blind spot. You should always check your blind spot regardless of this warning system though, just to be on the safe side, but it’s still a feature that I love. The high-intensity discharge headlights give a bright, crisp light that help you see more during the nighttime. I drove this around so often during the night because that’s my favorite time to drive and I could see so clearly because of how well it lit up the road. It was really awesome and definitely came in handy when we drove past areas without lamp posts and it was pitch black. 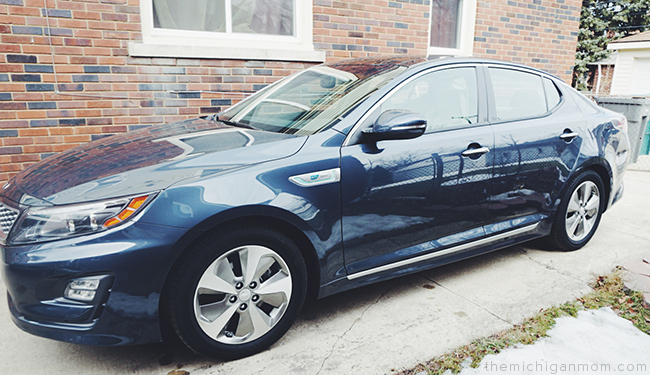 Overall, I thought the Kia Hybrid Optima was amazing. There was nothing about it I could even complain about because it was so nice to drive and all of the features it had were great for me. This would probably be the car I would purchase in a couple of years if I don't find something to top it, and I probably won't because it was the best of the cars I've reviewed so far. I'm coming back for you, hybrid optima! Wait for me. 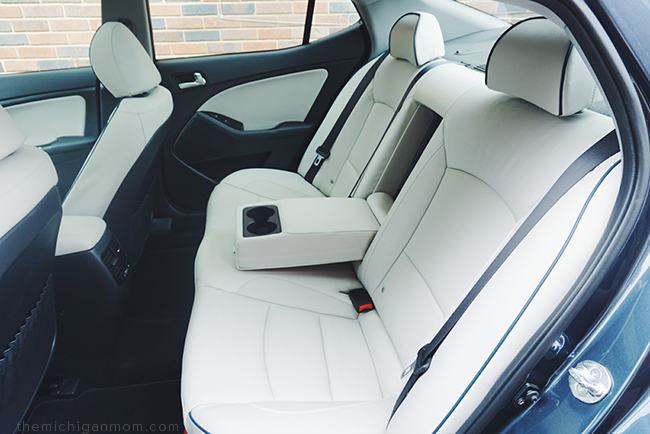 What is your favorite feature of the Kia Hybrid Optima?